Here is another pastel I did using Painter X3 on my computer. I just can’t seem to put down the pastel brushes. I think I love the sunsets so much because they are so colorful. Hi, Thank you so much for nominating me for the Liebster Award. It will take me a bit before I can answer the questions and post them. FM limits me in how much energy I have. Hugs back at ya! BTW, we have the same theme. I like how you set yours up with three columns. I just recently changed mine to this one. I like it because it doesn’t take over my art. Lovely Kerry – nice work on the brilliance of the sky. It’s called Magically Mixed Art Community. WOW! The red color group may be now one of my favorites. This just explodes and I love it! 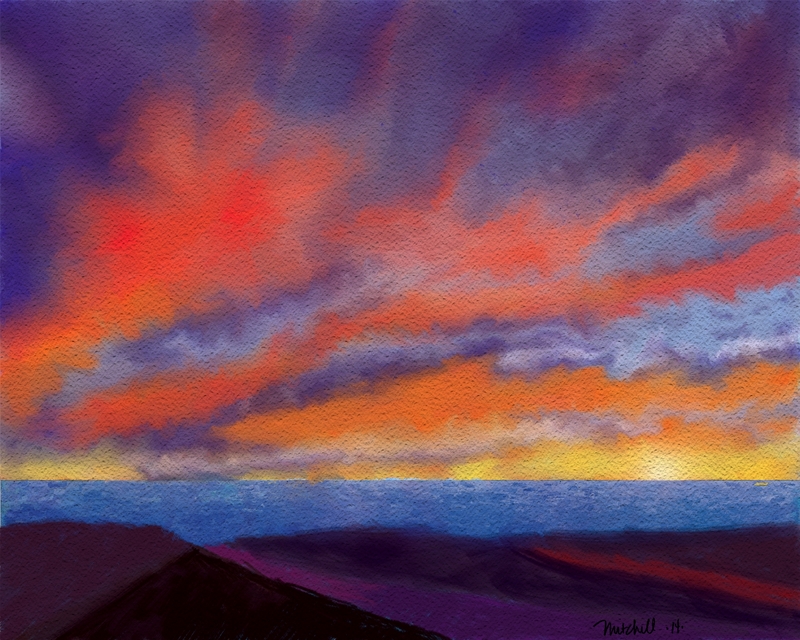 Wow, thanks for all your comments on my Hawaii pastels. You are so nice, Leigh. Your comments mean a lot to me. Thank you Sharon. I’m having so much fun with the pastels, I just can’t put them down. Thanks for your comment. I really enjoy what you are doing with your photographs. I just got Photoshop on CC and am exploring using my photos in my art.